When we think of nonprofits, we often think of them helping people or working for causes that improve our quality of life but are difficult to monetize. And usually, it’s their work and their cause that inspire us to give. What’s often not mentioned, however, is just how much Michigan’s nonprofit sector also contributes to our economic well-being. 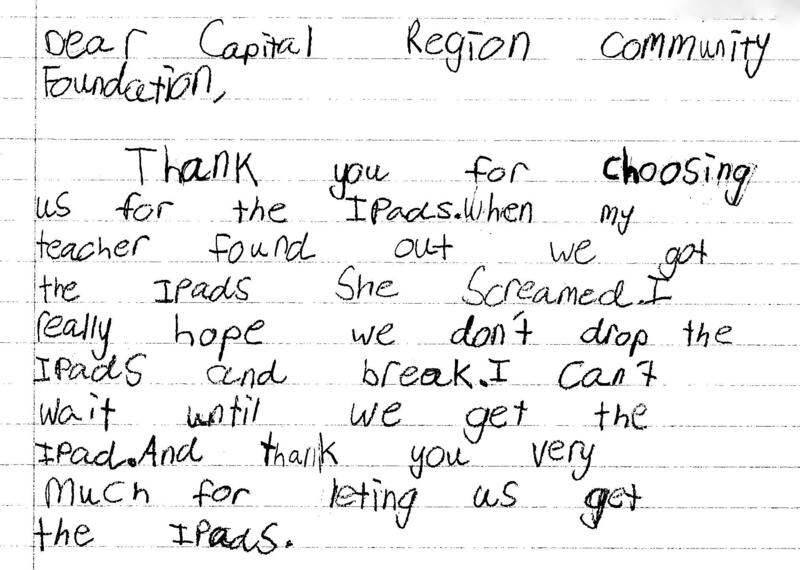 A letter from a student at Scott Elementary School in DeWitt, which received a grant from the Capital Region Community Foundation to purchase four iPad minis. Nonprofits employ more than 400,000 Michiganders, pay almost $5 billion in wages every three months, and infuse the state’s economy with more than $80 billion each year. Yet the knowledge alone that the act of giving would add much needed services — and even help put people to work — is obviously not enough. One of the things holding us back is we need more incentives to give in Michigan. This need for new incentives has only intensified in the past four years since one of our most effective ones was taken away. Among the major tax reforms in 2011 was the elimination of tax credits for charitable donations to homeless shelters, food banks and community foundations. This cost Michigan nonprofits $50 million in just 2012 alone. Without the tax break that came with an easy check of the box on tax forms, the ability to give to nonprofits in Michigan has been made that much more challenging. Earlier this month, The Next Idea contributor Amy Kaherl discussed the funding challenges Detroit nonprofits face. We’re seeing a similar situation in the Lansing area; there just isn’t enough money to go around. But let me be clear, that does not mean we are lacking the money to address all of our needs. In her essay, Kaherl focused on finding new ways to connect potential donors to nonprofits. Her idea was to have an annual expo where people can engage with nonprofits in a one-stop-shop and find the ones they feel good about supporting. I think that’s a great idea. But as we’ve seen from what happened when the tax credits were cut, a simple donation process is difficult to replace. Without the tax break that came with an easy check of the box on tax forms, the ability to give to nonprofits in Michigan has been made that much more challenging. For those who don’t have time to do the due-diligence themselves but still want to have an impact on bettering their communities, there is another route already available: community foundations. Community foundations are grant-making public charities that invest donors’ gifts and use the interest earned on those investments to support effective nonprofits in their region. In short, they do all the work for you. According to a study done by the RUPRI Center for Rural Entrepreneurship, it’s expected that $972.24 billion will transfer from Michigan residents to heirs in the next 50 years. That’s an average of $225,000 per household. “If just 5 percent of the 10-year transfer of wealth were captured into community endowments across Michigan, an estimated $7.03 billion fund would be realized,” the study says. Assuming a conservative payout rate on those investments, this means more than $350 million would be available annually for investments and grants into Michigan’s communities. Looking at the next 25 years, people in my part of the state — Ingham, Eaton and Clinton counties — will leave more than $17 billion to their children, grandchildren and relatives through their estates. If everyone left just 5 percent to our community’s endowment fund, we could change the future of the Capital region. Just 5 percent would result in almost a billion dollars in charitable gifts over the next 25 years in mid-Michigan. And that amount of money could yield almost $44 million in grants for our community every year. We could ensure that every child entering kindergarten is ready to learn and succeed. We could support mental health services for everyone in need. We could feed 12,000 hungry families for an entire year. We could add hundreds, if not thousands, of sorely needed jobs. I can’t imagine a better return on investment than that. The greatest wealth transfer will likely happen between 2015 and 2040. Much of this wealth is currently invested in family and vacation homes, retirement accounts and other appreciated assets — some of which may be heavily taxed if given to heirs. When you give through your community foundation, you can establish a fund in your family’s name, in the name of a loved one or in the name of a cause important to you. Endowed funds last forever and grow over time. Earnings are used to make grants in the name of your fund — creating a legacy of giving in and for your community. Now that’s an incentive. A community foundation touches every county in the state of Michigan. We’re all in this together — and together, with just a small commitment from everyone, we could change the future of the communities we call home. Robin Miner-Swartz is the vice president of marketing and communication for the Capital Region Community Foundation in Lansing. Robin Miner-Swartz shares her idea for boosting non-profit funding on "Stateside with Cynthia Canty"